Bungee Jumper | THERMO Spoken Here! Our jumper, a 120 pound "living-dangerous" lady, wants the ropes set so at the bottom of her jump she can scarf a fistful of water from the river. The jump sketch (right) shows three stages of her proposed event. 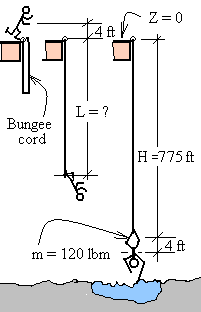 The elastic constant of the bungee cord is two pounds force per foot of extension. Calculate the length of bungee cord required. Initially, the cord is unstretched; its length, L1 equals its free length, L therefore L1 - L = 0. At the bottom of the fall, the cord length is: L2 = 775 ft. We enter these numbers with the mass and change of elevation of the woman. Certainly none of us would take the leap based upon this calculation. Multiple cords are used and some factor, maximum load per cord must be taken into consideration. Our equation, however, addresses the energy change of the event.